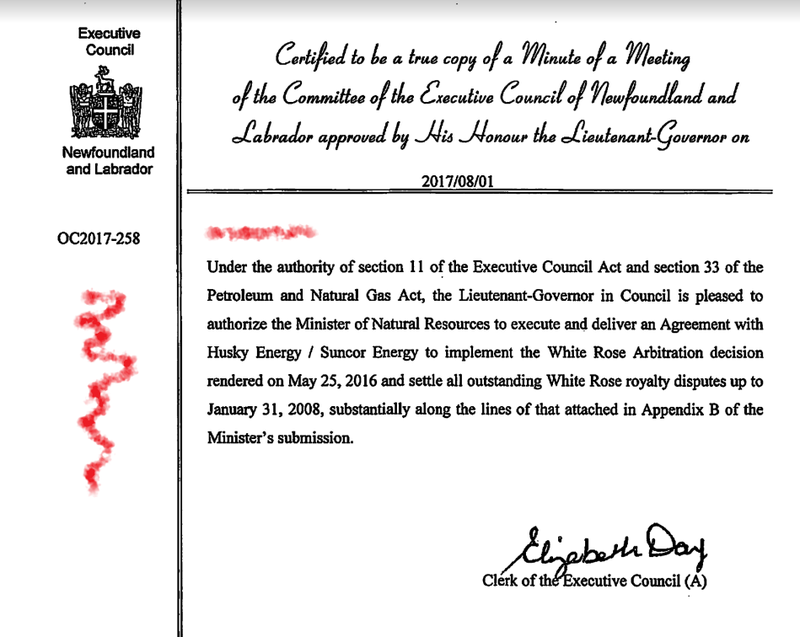 The regular review of the access to information law that led to the infamous Bill 29 included an amendment that stated specifically that cabinet documents could not be released. Before then, the law said that anything that revealed the deliberations of cabinet could not be revealed. The law passed in 2002 used a version of the wording used in the original law from 1981. The 2002 law said that no one could not disclose through an access request anything that would "reveal the substance of deliberations of Cabinet, including advice, recommendations, policy considerations or draft legislation or regulations submitted or prepared for submission to the Cabinet." In the 30 or so years that the province had operated with a freedom of information law using exactly that same wording, no one had made a mistake. Yet for some reason, officials in 2012 found the situation troublesome. They wanted very clear and very specific instructions. 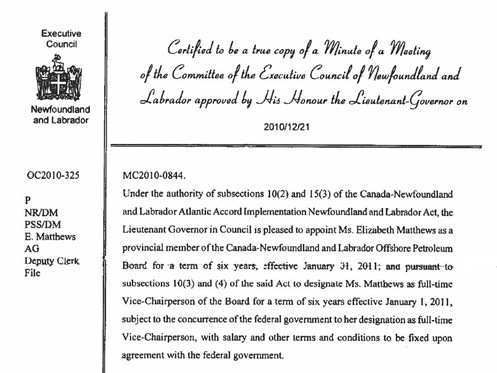 So the person who drafted Bill 29 copied a section of another law that defined precisely what a cabinet document was. It listed the type of documents and included this general description of what could not be disclosed in response to an access to information request: "an agenda, minute or other record of Cabinet recording deliberations or decisions of the Cabinet." That included - quite obviously - an Order-in-Council. After all, an OC is a "decision of the Cabinet." And so the public servants who provide administrative support to cabinet and its committees - known as the Cabinet Secretariat - started censoring the types of laws called cabinet orders. We know this started happening because in 2013, James McLeod - at the time a reporter for the Telegram in St. John's - asked for and received copies of some OCs. The fact there are deletions at all is one thing. The other problem is that we have no idea in this case why someone blacked out all the bits they blacked out. It seems to be based on the access to information law with the Bill 29 bits tossed on top. Except that in an ATIPPA response, officials are supposed to indicate the legal basis of the deletions. They usually cite a section of the access law itself. There's nothing here to show that authority and nothing in the other correspondence McLeod got at the time that explained the deletions either. Now we can figure out some of them. They look to be personal information. They've blotted out the name of the department involved in the distribution list right before the indication a copy of the order went to the deputy minister. But other deletions - like the part after the words "in accordance with" - are a complete mystery. What Cab Sec did at this time was similar to what other government departments were doing, anyway. They were using the access to information law to justify holding back all sorts of information. Even after 2015 and a new administration, ministers would often be told that something couldn't be released because the ATIPPA said so, even if the disclosure wasn't in response to an access request. the direction of the Cabinet Secretariat. That practice is actually one of the reasons why officials made some of the changes through Bill 29. They wanted to make legal what they had been already doing, not so legally. Anyway, that definition inserted in 2012 made it illegal to disclose an OC at all. But clearly someone in Cab Sec thought that would be a problem in completely withholding a document that is supposed to be public. So they so they tried to release just parts of them, relying on other bits of Bill 29 or whatever rationalisation they needed to justify the new practice. At some point after the Bill 29 fiasco and the new access to information law passed through the House, Cab Sec continued to censor orders. They just censored different bits. Your humble e-scribbler ran into it in 2018r while chasing down another issue. The Clerk of the Executive Council at the time sent along a copy of several orders in council. They were all missing information in two spaces marked in red on the picture at left. Look at the one above and you can see immediately what's not there. The distribution list is missing as s a reference number to a document that was the basis for the order. In the one above the Order in Council appears to have been based on a Minute of Council. In other instances, the number here consists of a letter code for a particular department or cabinet committee, the year in which the document was produced, and a sequential number that offers absolutely no indication of any cabinet secret by any meaningful definition of the term. I have checked with staff in my office who advise that the copies of the OC’s forwarded to you yesterday have indeed deleted the information you note as such information falls under the category of “Cabinet confidences” and is not released publicly. Not currently released maybe, but in the past it certainly was. 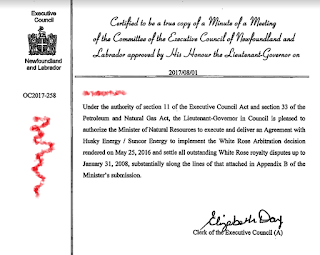 The cabinet order shown at right is dated 21 Dec 2010. 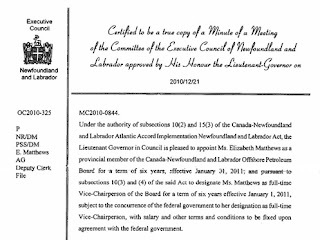 Cabinet Secretariat released it in a pile of emails and other documents in response to an access to information request about the effort by the the provincial Conservative administration at the time to install Elizabeth Matthews, as she then was, as vice chair of the offshore regulatory. The whole thing was a farce in itself, but take a look at the copy of the cabinet order released by Cabinet Secretariat. There are no deletions at all. Clearly whatever Cab Sec is doing today is not what it has done in the recent past and it is completely at odds with what happened before 2012. As you can see from the reply given by one of the Recent Clerks of the Executive Council, Cab Sec justified the deletions as a policy that, implicitly, had always been the case. What appears to have happened is that new Clerks and others transferred into the Cabinet Secretariat just carried on the practises they'd learned from the people there before them. They took them for granted and assumed that was how things had always been done. "Always" is an important word in this case. What Cabinet Secretariat does every day is one of handful of these most important legal and constitutional functions in our country. Why and how orders get formally issued are every bit as important - if not more important - than what is contained in any particular order. The correct practises and customs - the conventions - are an integral part of how governments work. What this example shows, though, is how someone can make very significant changes to important activities and then see them carry on when there is a great deal of turn-over in key positions. Institutional memory, that is, the knowledge of how things get done and why, often disappears. That sort of information may not be crucial in a private business but when it involves how laws are made and disclosed, institutional memory and correct practise are essential. In a place like Cabinet Secretariat, where the key positions change regularly, it's not likely very many people remain in key decision-making positions whose personal experience in the office goes back more than a couple of years of years. The current Clerk, for example, became Assistant Secretary to Cabinet for Social Policy in January 2016. Before that she was in a line department, far removed from the intricate world of cabinet operations. It's not just Cabinet Secretariat that follows this practise. 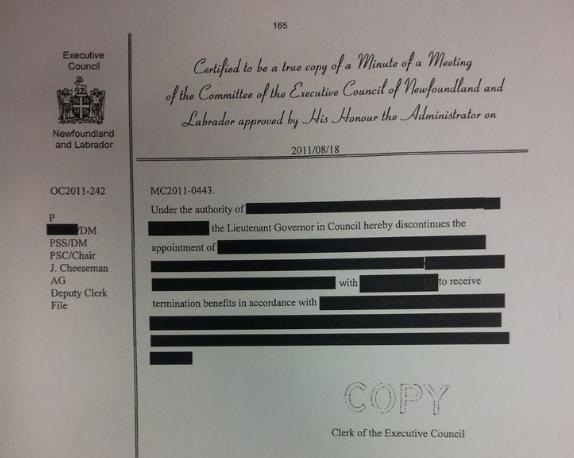 The Muskrat Falls Inquiry has also been following the practise of censoring Orders in Council. They delete different things and, in fact, the documents are typically entered into the official records as exhibits under descriptions that mask what the documents actually are. There's no obvious reason for the bizarre practises but it is what the Inquiry has done. The fact that they are lawyers and judges following irregular practises does not make the abnormal practises normal. It merely shows how easily oddities - sometimes improper, illegal, or unconstitutional ones - can go unnoticed in a topsy turvy world.